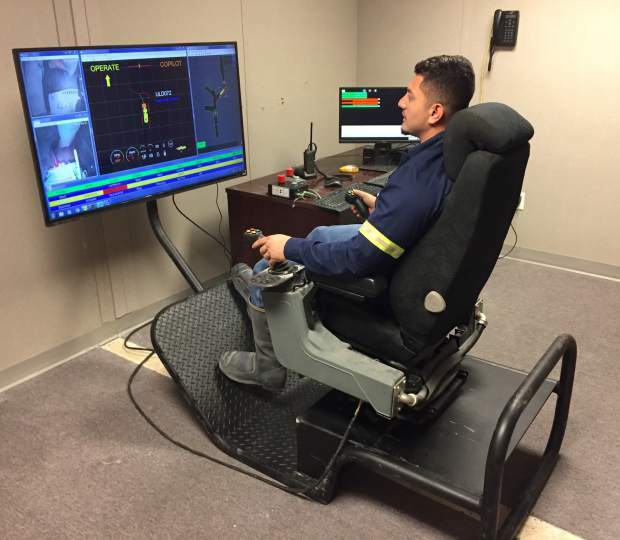 Newmont Mining Corp. already has autonomous trucks in operations at its underground Leeville operations, and it’s studying the results of a digital assessment conducted last year at its Twin Creeks operations to determine where additional technology might come into play. Mike Wundenberg, Newmont’s leader of operations technology and innovation, says the digital assessment at Twin Creeks provided Newmont with many different potential avenues where technology could be used and what technologies the company can advance. Wundenberg is part of a newly created group at Newmont whose goal is to advance Newmont’s operations in the digital space. Team members include employees from the company’s mining, processing, infrastructure and data analytics functions who are working together to advance value-driven technology and innovation. RFID tags for miners: As one element of a connected workforce, radio frequency ID tags on mining helmets allow constant tracking of miners and equipment from the surface or a central operations location. It’s less “Big Brother” and more geared toward safety — the whereabouts of mine site personnel are continuously monitored. It’s an important safety aspect when hundreds of people are working around massive mining machinery. Sensors in haul truck and loader tires: These sensors monitor tire temperature and pressure, and information is relayed to dispatch systems in real time. The tires on the largest haul trucks easily dwarf a six-foot tall person and are extremely expensive. Constant monitoring of temperature and pressure allows mining companies to maximize fleet performance. The technology has helped Newmont realize more than $17 million in annual productivity improvements since 2014, said Scott Lawson, Newmont’s executive vice president and chief technology officer during the company’s investor day conference last December. “The key thing is understanding what business opportunities are available and the challenges you are trying to solve or achieve with technology,” Wundenberg says. “We had discussions with Caterpillar about what we were looking for and where they were heading. They had a product they were trying to develop further, and to do that they needed an operating mine. “It is a pretty good recipe for success when as business we can evaluate new technology and have a partner who wants to develop a product. It’s a good example of how technology is changing roles and increasing safety within the mining workforce as well. However, with technological improvements data is now streamed live back to Newmont’s central offices in Elko, where a small team oversees the data for the company’s Northern Nevada fleet. “Technology covers such a broad range in our business. We really look at technology from a value and operational improvement perspective. We have run a full potential program at Newmont, which is really a platform for continuous improvement. We have been working hard on that for the last five years, and about $1.5 billion in efficiency and productivity improvements already has been delivered through that program.